We are the top Silk Road tour operator based in Dunhuang, China. We focus on providing well designed Silk Road tours with resonable price and thoughtful service. Created by a group of like-minded individuals who share affection and expertise of the region, The Silk Road China Tours aims to provide high quality tours throughout the Silk Road in China. Our knowledge comes from years of practical experience leading and guiding visitors around this most spectacular part of China. We are dedicated to giving our clients the experience of a lifetime and are confident that with our local know-how and regional connections we can do just that time after time. We understand the essential ingredients for any tours; from clean and comfortable accommodation to excellent cuisine and the chance to immerse oneself in the culture of the country you are visiting. Whether you are part of a group tour or a tailor made itinerary our staff both in the offices and out in the field will ensure that your every need is catered for. We aim to scratch beneath the surface and unearth the real Silk Road for you – its cultures, history and peoples. We also believe in creating tours that strike a balance between scheduled events and free time, allowing you to see the destinations at your own pace. Jiayuguan Huashang International Travel Service Co., Ltd. Dunhuang Branch, is approved by the Gansu Provincial Tourism Administration, Gansu Provincial Administration of Industry and registered in full payment of travel quality and travel insurance liability insurance, is a integrated travel service business with independent legal personality of the professional travel company. 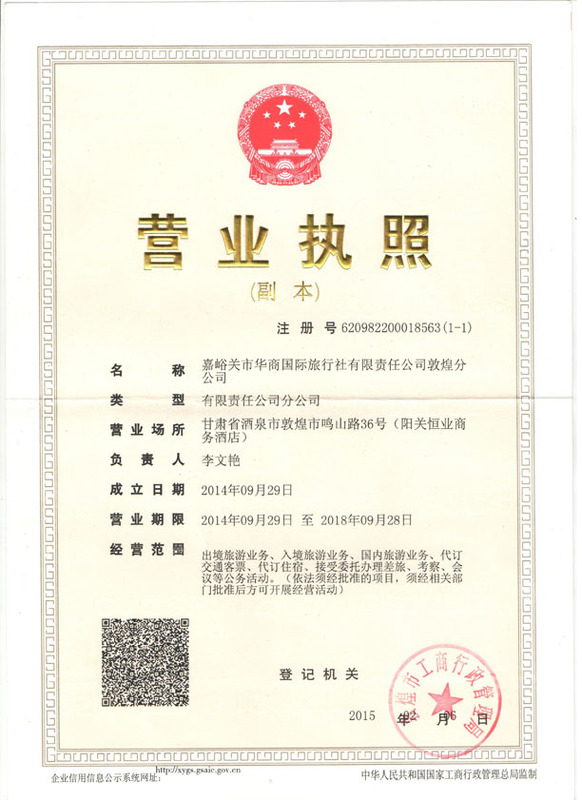 Jiayuguan Huashang International Travel Service Tourism Management License No. 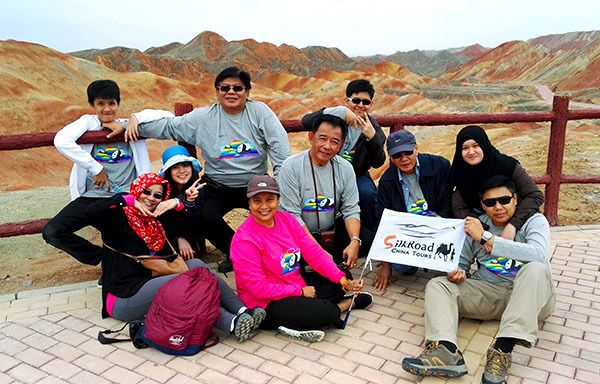 L-GS-cJ00044, specializes in organizing various tours featuring the Silk Road. Our traditional products cover the Silk Road culture, grotto art, religious worship, desert camping and other special tourism, and we developed off-road tour, outdoor hiking, glacier adventure, wonders of the desert, Gobi adventure, study travel, leisure travel, experiential tourism and other special tours. Less operating cost and more payments to staff will just make the tour price more reasonable and the tour more pleasant. Need only 3 steps to finish the booking and you can choose the third party platform transaction to ensure the safty of your money. From booking your trip to the moment you deplane, it's our mission to make your travel experience a great one. We are the top Silk Road tour operator based in Dunhuang - the great intersection of the Silk Road. We are dedicated to providing top quality China Silk Road Tours. Whatever you come for vacation, photography, exploration or field sport - we can accomodate your special requirements and arrange an impressive tour at a reasonable cost. Our guides embody the spirit of the Chinese Northwesterners, welcoming visitors with hospitality and a friendly attitude. We employ the finest guides on the Silk Road, trained by rigorous tests, and prepared as leading experts on the Silk Road history and environment. Entrust yourself to a friendly, professional tour guide from The Silk Road China Tours for memorable experiences along the Silk Road. Our prices are updated constantly to ensure the lowest cost available without compromising quality. 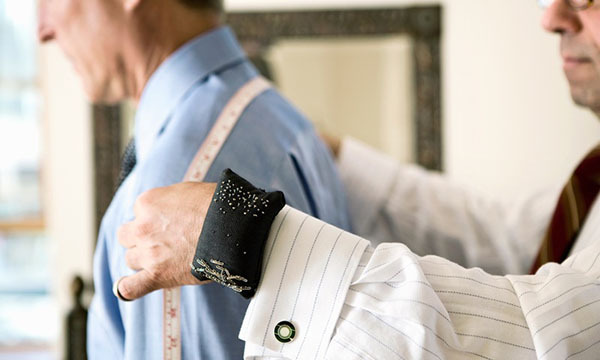 We are the people you will contact and we are the people offer face to face service to you. Therefore, you pay less for more. We have more than ten years of experience in the travel business. We are well versed with the history, politics, culture, environment of northwestern China, and share this information with our clients as we traverse the historic sites we visit. Our honest, hard-working and knowledgeable team stands ready to serve you on your magical Silk Road adventure. Whatever you come for - vacation, photography, exploration or field sport - we can accommodate your special requirements and can arrange an impressive tour at a reasonable cost. To satisfy your special requirements, we can arrange all kinds of vehicles with experienced drivers to take you safely and comfortably to the places you want to see on the Silk Road in China. All our guides are knowledgeable. They will give you important information that will enrich your tours and understanding of the history, culture and geography of the landscapes along the Silk Road. We offer all the equipment needed for a desert adventure, e.g. outdoor tent, sleeping bag, moisture-proof pad , Satellite phone, walking sticks, outdoor cooker, etc. We know every city and every hotel on the silk road very well. So, we can find the right hotel and book your room at a highly competitive price. It’s been a headache for visitors travelling in China. Our agency can help you to book air, train and bus tickets. We can help you to effectively communicate with local people. We can arrange multiple days desert tours for you during which you will have the special experience of camel riding, desert surfing, desert picnic and desert camping.